David Moakler, our founder, learned that when a financial counselor sits next to a social worker on a long flight, some great ideas can be born. In November of 2005, that’s just what happened. A critical need was discovered. 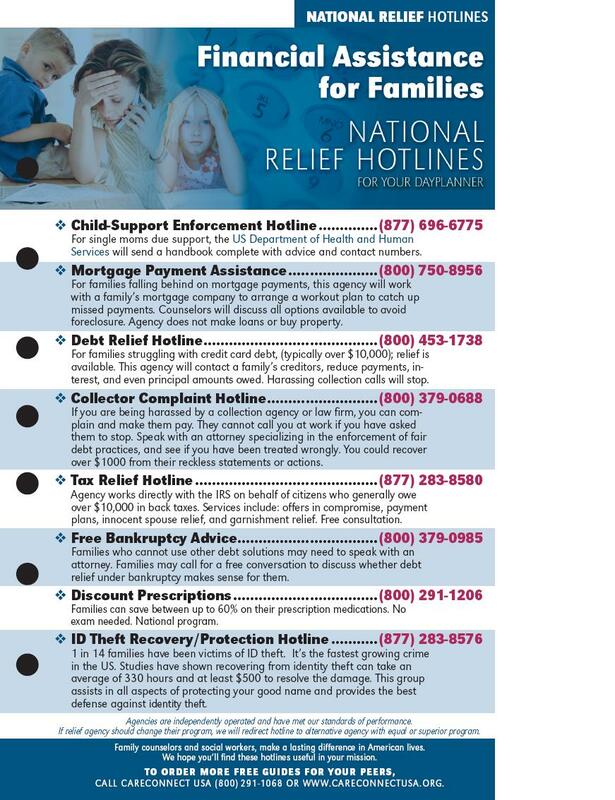 Thousands of counselors, ministries, and social workers who help families in financial crisis had too few resources to call upon. The helplines they had were regionally limited and tricky to find. As the idea took form, he felt a sense of duty to see it through. CareConnect USA would create free tools for counselors, so they could better assist their money-troubled clients. 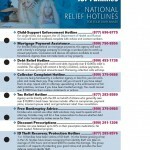 The helplines were distributed in various formats as best suited for use. Soon corporations began asking for the helplines in a poster version for their lunchrooms. Below is a list of our Greatest Hits! 2005 Small Dayplanner Insert – Made of a sturdy laminated card stock, this list of helplines fits neatly into the standard 7-punch day planner. 2006 Large Insert for Resource Books – For counselors who work in hospitals and clinics, these fit all standard reference binders. 2008 EAP Card – Employee Assistance Professionals often work in office call center environments. A handy reference card to keep near their computer is still a popular design. 2009 Workplace Poster – Human Resources Managers asked for a poster for the break room. To date, our most distributed item, these are made available at conferences and can be printed here. Any industry with employees can put this free tool to work. Studies show that employees who are not stressed about their bills are more productive in the workplace. 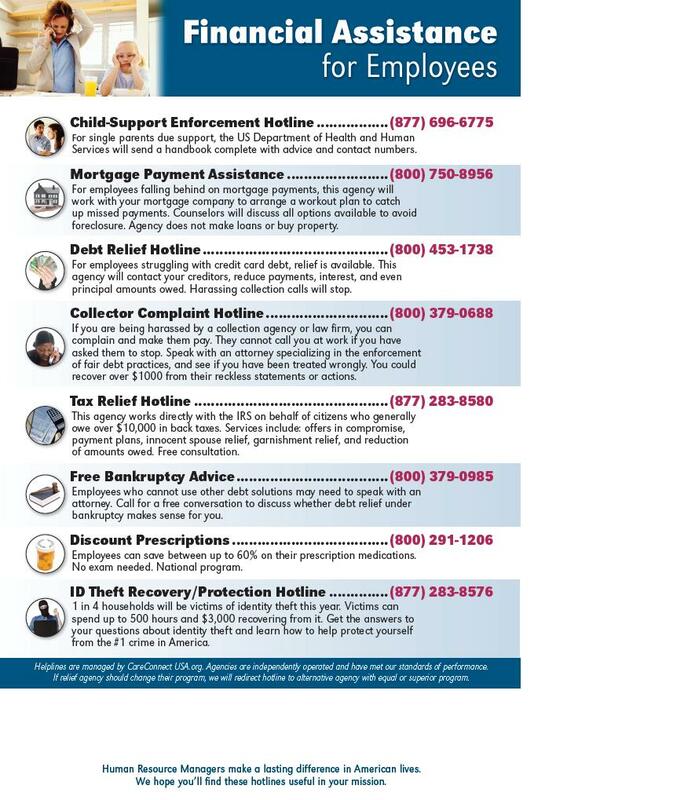 Financial Assistance for Employees and Families. Instantly connect with non-profit centers and government agencies for free advice. A vital tool for managers and counselors. Share with your entire workforce or client base. Social Workers and counselors may share it with families, clients, and peers. 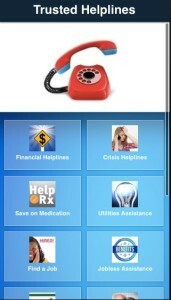 New helplines coming all the time.